The first signs of nerve damage can be pretty scary—you might notice that you’ve cut your leg but didn’t feel anything. Of course, nerve damage symptoms could be marked by the exact opposite sensation: intense pain, tingling, and burning for no known reason. Symptoms and signs of nerve damage take many different forms because there are literally tens of thousands of nerves in your body. No known cause (which may account for up to 30% of cases). 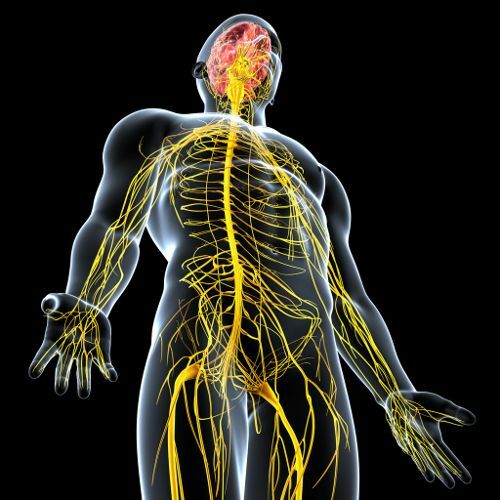 Your peripheral nerves are spread throughout your body. They are part of your skin, muscles, and organs. Your brain and spinal cord send and receive messages from the nerves, allowing you to move, feel, and function properly. When nerves are damaged, this communication cuts off, and things don’t work like they are supposed to. Movement can become much more difficult due to increasing numbness or weakness; intense pain may subsist when there is little-to-no stimuli, or you may feel nothing at all. These are the nerves that control involuntary bodily functions like heartbeat, breathing, blood pressure, digestion, and your internal temperature. These nerves control movements by passing messages between your brain, spinal cord, and muscles. Picking up a cup, typing on a computer, and walking are your motor nerves at work. These nerves relay information from your skin and muscles back to your spinal cord and brain. They are responsible for pain, or the sensation you get from touching a soft blanket. Nerve damage symptoms are quite diverse and they usually appear rather slowly. Because the signs of nerve damage are gradual, there is a good chance they can at least be recognized and partially treated. At times, they will signify a greater health issue, while sometimes the symptoms may be temporary and disappear. Regardless of what symptoms you experience, it’s recommended to get to a doctor for examination. If you wake up with some numbness or tingling in your arms or legs, or experience it after you’ve been sitting in the same position for an extended period (like watching a captivating movie), the feelings are likely a temporary symptom of compression. And it should end within a few moments. On the other hand, if these sensations don’t go away, it could signal nerve damage. Tingling, burning, and numbness is most often felt in extremities like your toes, feet, fingers, and hands, and have the potential to extend through your arms and legs. If you have constant “pins and needles,” excessive burning, or limited feeling—you don’t notice when you cut yourself shaving or touch something hot—get to a doctor as soon as possible. Weakness or paralysis can occur if your motor nerves have been affected and the brain cannot get your body to move in the way you would like it to. Before nerve damage can be diagnosed, however, some other issues have to be ruled out. It’s very important to get to a hospital if you’re having an inexplicably hard time moving because it could signal the need for urgent care: you may be having a stroke. Pain running down just one leg could be a sign of nerve damage. The pain would start in your lower back and travel down the back of one leg. Pain could come in the form of tingling, burning or a sharp pain, and could indicate sciatica, which is the compression of the sciatic nerve. Sciatica could be caused by a slipped or worn-down disc in your spine. Stability issues can also be a result of nerve damage. Sometimes larger nerves that impact sensation and proprioception (your sense of the positioning of body parts) are impacted, making it harder to maintain balance and spatial awareness. Co-ordination may be impacted as well, leading to injury risks from stumbles or falls. If a nerve in the neck gets pinched, you may experience shockingly painful headaches. Once again, it is wise to see a doctor—the best relief may be from a nerve-blocking injection that relieves the pain until other treatment options are established. If you’re sweating profusely while standing outside on a cool autumn day or not sweating at all when going for a jog under the hot summer sun, it could be nerve damage. Symptoms like this could result from dehydration or high blood pressure, but they can also indicate that the nerves carrying information from your brain to your sweat glands—which help regulate your internal temperature—are damaged. The type of symptoms you feel will largely be reflected by which nerves are damaged: autonomic, motor, or sensory nerves. As mentioned, diabetes is a major cause of nerve damage, and it’s often the result of decreased blood flow and high sugar levels. Roughly half of people diagnosed with diabetes go on to experience some nerve damage, although symptoms don’t usually appear until long after diagnosis. Therefore, if you have diabetes, it is of increasing importance to manage blood sugar levels and weight. These are not the only symptoms diabetics may experience. They can also go through the signs of nerve damage mentioned earlier. One of the best ways to prevent nerve damage is to prevent diabetes. This means eating a healthy diet that is low in refined carbohydrates like soda, candy, and chips, and choosing food with a low glycemic load. Most fruits and virtually all vegetables and whole grains fall into this category, so they should make up the bulk of your diet if you’re aiming to prevent diabetes and the resulting risk of nerve damage. Getting regular exercise in addition to a healthy diet can also help prevent nerve damage by promoting healthy blood pressure and weight management. If you are a diabetic, you should still work on these things in order to help control blood sugar. Because nerve damage comes on gradually, it is best to have it diagnosed as soon as you experience the slightest concern. As is the case with most health issues, the earlier it’s recognized, the more treatment options exist. Research on mice has indicated that omega-3 fatty acids may help regenerate cells to offer preventative measures, and potentially treatment, for nerve damage. Although more work on the topic—particularly studies in humans—needs to be accomplished, it is possible that regular omega-3 intake through diet (salmon, sardines, etc.) or supplements may help nerves strengthen. Nerve damage can be a very dangerous and debilitating condition if it is left alone. Although there are no guarantees, getting to the doctor early at the first sign of nerve damage symptoms can give you the best chance at minimizing their impact on your life. Nerve damage symptoms can show in various ways, including numbness and weakness, inexplicable severe pain, or uncontrolled twitching, so pay close attention to anything that might be out of the ordinary. “Nerve Pain and Nerve Damage,” WebMD, 2016; https://www.webmd.com/brain/nerve-pain-and-nerve-damage-symptoms-and-causes#1, last accessed October 24, 2017. “Diabetes and Nerve Damage,” The New York Times, August 5, 2014; http://www.nytimes.com/health/guides/disease/diabetic-neuropathy/overview.html, 2014; last accessed October 24, 2017. Queen Mary, University of London, “Omega-3 fatty acids could prevent and treat nerve damage, research suggests” ScienceDaily, January 11, 2012; https://www.sciencedaily.com/releases/2012/01/120111103856.htm, last accessed October 24, 2017. Harlan, C., “8 Signs You Might Have Nerve Damage,” Prevention, November 7, 2016; https://www.prevention.com/health/8-signs-you-might-have-nerve-damage/slide/1, last accessed October 24, 2017.